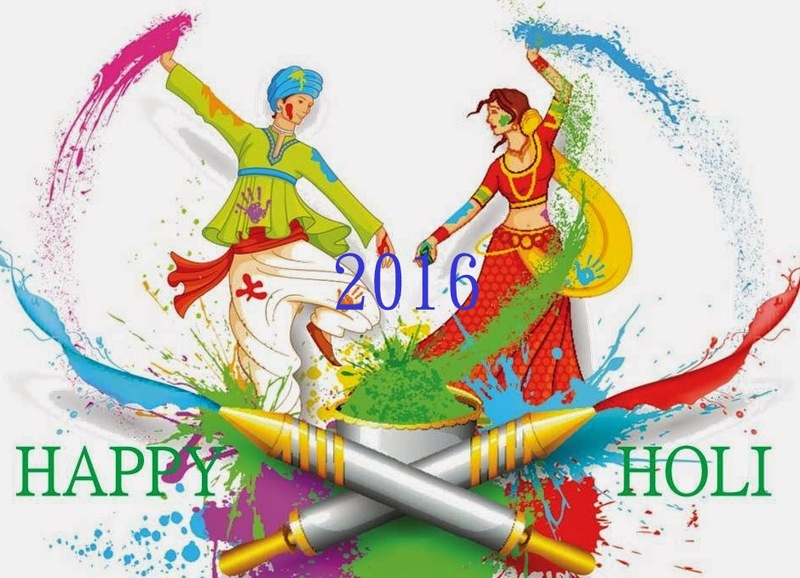 Happy Holi 2016 : Holi is a festival of colors celebrated all around india in different forms but with the same intensity of joy, togetherness and love. this year holi festival is falling on 24th march, 2016 (thursday). How Is Holi Festival Celebrated ? Holi celebrations start on the night of the full moon with the burning of Holika on the eve of Holi. Bonfires are lit which symbolises the destruction of Holika. People dance and sing around the fire making it a fun filled evening. The following morning people throw colours, coloured water and “Gulal” on each other. Men attempt to tease women by getting them drenched in coloured water. Children enjoy the festival by throwing water filled balloons. Throwing of colours is savoured with delicious Holi specialties like Gujiya, Puran Poli, Malpuas and downed with glasses of “Thandai”. In some parts of India especially Mathura and Barsana, Holi celebrations last for almost a week. Each and every major temple in these towns celebrates Holi bash on different days. When Lord Krishna was young, he envied the fair skin of Radha. To express his envy, Krishna rubbed color onto Radha’s face. This act of showering another person with color is now considered to be an expression of friendship and love. This story forms the well-known tradition of showering other people with color during Holi celebrations. 1. Oil your body and hair with coconut oil. It will be easy for you to remove the colour later as the oil will act as a shield between your skin and the colour. 2. You can avoid using chemical colours all together; instead, opt for organic colours and mix them in water. 3. On the day of the festival before you start off with the water wars, slather yourself with sunscreen to protect yourself in the sun. 4. Make sure your clothes are of breathable fabric like cotton. Other fabrics mixed with colour might cause rashes on your skin. Cotton, on the other hand, will let your skin breathe. 5. Also, make sure you keep your nails short and apply nail paint on them to keep them safe. 6. Apply Vaseline on your lashes and around your eyes before you start playing. This would remove the colour faster from your eyes. 7. Once, you are done playing, wash your face and body thoroughly, but be gentle. And if the colour doesn’t go then make a pack of gram flour, sweet oil and milk cream in rose water and apply it to your body and face. Let the pack dry and the colour will come off once you wash.
8. Moisturise your body well, once you are done taking a bath. 9. Add some rose water drops in your eyes and rest. Your eyes too need to be cleansed; this is the best way. 10. If there are colours that you are unable to remove then a mixture of some curd and lime juice will definitely remove the most stubborn colours. Skin and Hair Care Tips For Holi 2016 – All Skin Types!